Disclaimer: I haven’t read Jared’s two–part piece on this, and I won’t until after this posts. I like my impressions to be my own. It’s rotation time! 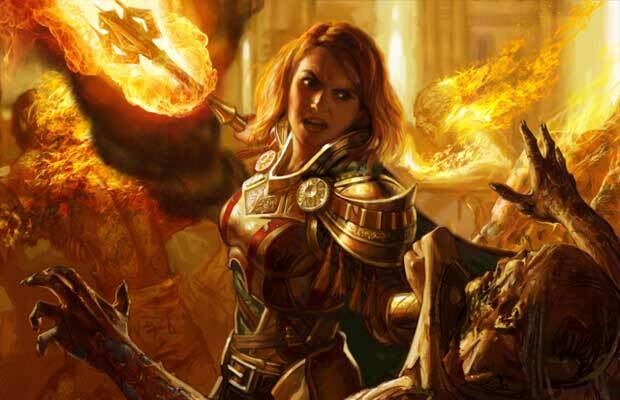 I’ve written recently about the cards that I’ve picked up from Theros block, and now I’m going to share my list of things to trade for to fill my long-term binder. Most of these cards are popular in casual formats, and I’m looking to pick these up and sock them away for a year or two. If they aren’t reprinted (this is always a concern) then their value will slowly creep up over time. The example of this is Tamiyo, the Moon Sage. 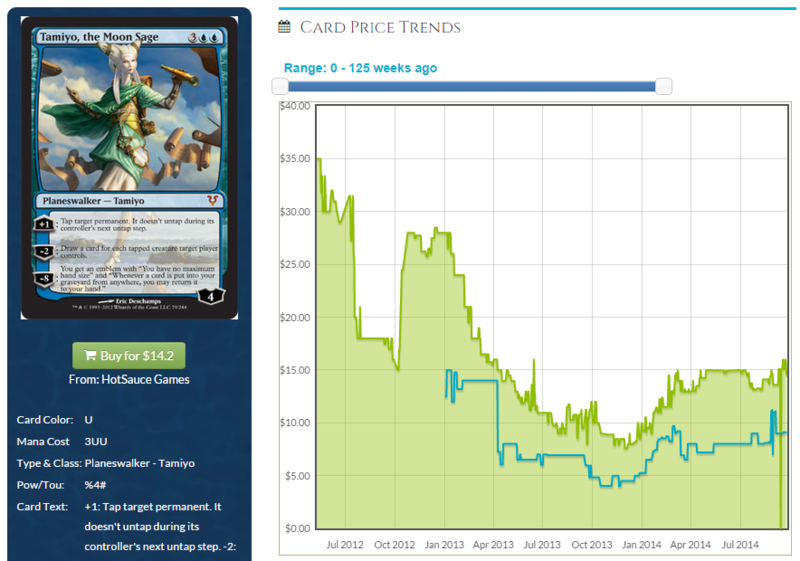 When Avacyn Restored rotated out last year, she could be had for $8-$10 as she was traded away from control players. In the year since, she’s climbed to nearly $15, while seeing not much play in Modern. She’s very good in Commander and deserves consideration in Cube. So my goal is to identify the cards that are cheap now, but have good room for growth in the next couple of years. This is the easiest call of all. M14 was under-opened due to Modern Masters, and Garruk hasn’t had a chance to shine in Standard. He’s got a shot in Modern, I’ve seen some ramp lists that use his minus ability to drop Progenitus onto the battlefield, but it’s in casual formats that he makes his hay. It’s a plus ability that will likely draw you 2-3 cards, and action cards at that! Getting him at $7 is a steal. The growth won’t be fast, but it will grow. It’s unlikely that this will be reprinted in the coming Commander product, making it one of the safest bets on this list. This was $40 at one point, when it was in a single edition of the 2011 Commander decks. It’s got a promo version hanging around, and it is one of the best ways to deal with graveyard shenanigans in casual formats. You can exile anything, but you only get bonuses if it was a creature. Every Commander deck needs a way to interact with graveyards, and this is one of the best. This ticks two boxes on the ‘makes casual players giddy’ list: it’s a Hydra, which is a surprisingly expensive tribe to build. It is also a counter-doubling card, and it is amazing at that. Its price has been slowly ticking downwards, and it might get to $5 in the next few weeks, but I’d be comfortable getting in at $7 and then just being patient. Anyone building a new Abzan Commander deck is going to want one of these in the worst way. We aren’t lacking for ways to clear the board in casual formats. This is a very unique spell, requiring only nine mana, as opposed to Liliana Vess’s ultimate or the buildup of Grimoire of the Dead. Since you get everyone’s creatures, all it takes is one effect granting Haste and it’s over. This is one that I’m afraid of getting a reprint, since it’s so thematic with Liliana. The mythics from this set are what you really want to watch, as the maze runners were intro pack foils. Progenitor Mimic is the neatest of the bunch, offering tokens and copies together. There is a huge supply of shocklands out there. If you needed them for Modern or Cube, you already got what you needed. I cannot overstate the supply of these cards, and there’s a good chance that lots of people have saved a few shocks for decks that are yet to be built. With that in mind: We’re at a floor for these cards. They are not going to go up quickly. They are probably not going to be printed in Modern Masters 2 next summer. I don’t know when they will get printed again, but they will get a new print run eventually. The key is then to get them now, cash them out in a year or two, and move on. Foils are a different matter, being in the $30-$40 range right now. I am aggressively trying to trade for these, as foil prices are never going to be this low again. Even if they are in a new Conspiracy set or the like, that won’t be for a long while and these foils will be at least $10-$20 more within a year. I think that it’s only a matter of time until this and Beck//Call blow Modern open into a combo deck. Until then, this is very low-risk to sit on. I’ve spoken of her before. Case in point: Gisela, Blade of Goldnight is $11 now. Aurelia will be there in a year or two. This even sees some Legacy play in some OmniShow builds! Getting a stack of these at near-bulk is a fun bet, and at this price, even a modest increase can pay off big. Be wary of trying to cash out a bump all at once: what Travis has referred to on Twitter as ‘pulling a Ghave’ in reference to his article. I don’t need to repeat myself again, do I? I’m keenly aware of the ease of reprinting this card, but the huge gap between regular and foil ($1 vs. $13!) tells me this is one to watch. See above, but RtR shocks are slightly lower in price, perhaps more of it was opened than Gatecrash? If only we had real numbers. It’s seeing Modern play and I’d need a very good reason not to play it in Commander or Cube. I’m not going to go too deep, but having a playset or two will be very nice in a year or so. That’s right: This is the 9th–most valuable card in Return to Ravnica at this point. It’s casual gold and it’s only going to get better from here on out. You’ll never see a spike, but you will see incremental growth until it gets reprinted. That’s a ‘when’ it gets reprinted, not an ‘if’. I wouldn’t be surprised if Modern Masters 2 had all ten filterlands, plus this, in order to support a heavily multi-color set. There are a couple of cards out there that are better at helping a five-color deck (Prismatic Omen, Joiner Adept) but they aren’t artifacts. This is another card with a striking foil price. Part of that is Terese Nielsen, who does consistently fantastic work, but this is a big card in Modern and Legacy sideboards. I like regular versions at $1, but the foil seems like an easy pick to be $20 (up from about $11 right now) in a year. So Eidolon of the Great Revel is a four-of in Burn decks? Ash Zealot is a fine follow-up to Goblin Guide if you want to do a lot of damage quickly. (No, really: three damage from them fetching into a shockland, then you GG and Zealot, and they are at 11 when they start turn 2.) Eidolon may be the new guy tearing up the charts, but Zealot was there immediately and will keep seeing play. Keep some around and just wait. This list is fantastic and I couldn’t agree more on your choices. Well done. On another similar topic, I’d be curious to see how other readers feel about long term specs versus short term ones. I fit into a demographic that doesn’t have the time to work on short term specs so long term specs are really the only ones that interest me. I have some doubts on ash zealot but i guess the investment isn’t that much not worth risking!